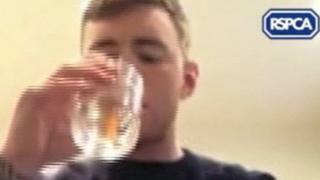 A man who was filmed swallowing a live goldfish as part of an internet drinking stunt has been fined. Gavin Hope from Gateshead is seen downing the fish followed by a pint of beer laced with chilli during the "Neknomination" prank on Facebook. Appearing at Gateshead Magistrates Court, he admitted failing to meet the needs of a goldfish and was fined £300. The 22-year-old said he was going to flush the fish down the toilet anyway, because he thought it was sick. The prosecution was brought by the RSPCA under the Animal Welfare Act. The hearing was told that Hope, of Lauder Way, Pelaw, must also pay a £30 victim surcharge and £431 in costs. RSPCA chief inspector Michelle Charlton said: "The video shows Mr Hope prepare a pint glass with lager, chilli, tequila, a fresh egg and fish food. "He picks up another glass containing a small amount of water and the goldfish, which is swimming around, and shows it to the camera before drinking it down, and following it with the pint. "A vet report advised that the stomach would be a completely unsuitable place for a goldfish and that the fish would have died in time, the cause of death being a mixture of suffocation and acid ph levels in the stomach, as well as the alcohol he drank." The court heard that Hope thought the fish was ill because it kept swimming into the sides of its tank and was going to flush it down the toilet. He then decided to drink it as part of a Neknomination challenge - an online drinking craze. Hope told the court he had acted "impulsively" and was "ashamed". He pleaded guilty to an offence under the Animal Welfare Act in that on or about 31 January he failed to meet the needs of a goldfish by failing to protect it from pain, suffering, injury or disease by drinking it.